I need a maintenance cartridge for the Canon iPF700 large-format printer but I'm not sure what to order as I was told that the Canon iPF700 uses two cartridges. Is that correct? Thank you. Shopping for your new iPF-700 ink takes only 1 or 2 minutes, that is not much when compared to the tedious task of phoning every shop that exists in town to find your replacement supplies. Why throw away your valuable time! We've already completed all of the researching so that you can buy the whole listing of ink cartridges identified as a suitable match for your iPF 700 printer. Save your cash and time if you buy printer supplies from Cartridge Save! Shop for your Canon cartridges online through Cartridge Save and get the provision of free next day delivery on every item. Our whole business is totally committed to offering you great value for money, we are just as passionate about making sure that each and every iPF700 inkjet cartridge does what you want in every way. To give you more peace of mind that we'll not provide anything besides high-quality cartridges, everything has Cartridge Save's full cash back guarantee - in the event you have any difficulty mail the broken printer cartridge back to us to get your order credited to you. The Canon ImagePROGRAF iPF700 is aimed at corporate users looking for a cost-effective printer for their GIS, CAD, AEC, and other large format projects. It is integrated with the latest technology for more accurate and quick printouts. Some users complain of insufficient after-sales support, though. Weighing much lighter than its predecessors at 39 kg, the Canon ImagePROGRAF iPF700 is an improvement from previous designs. It uses the PF-01 printhead with full-lithography inkjet nozzle engineering (Canon FINE) print technology. 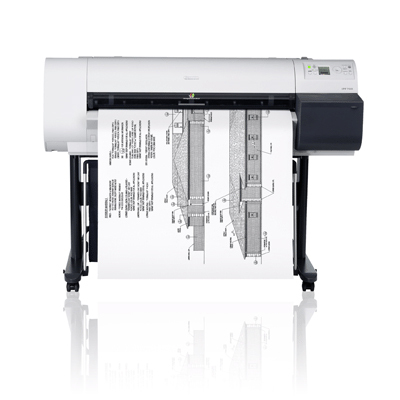 The maximum print resolution for the iPF700 printer is 2400x1200 dpi. Standard interfaces include Ethernet and built-in USB 2.0. Borderless printing is supported. Users are provided with 2 paper feeding methods: front loading manual and rear loading roll. This device measures 43.2x59.3x29.6 inches. The optional Firewire interface contributes to speedier results when printing with the Canon ImagePROGRAF iPF700. The 5 colours with the 1200 dpi x 2-row nozzle pitch ensures high quality and vibrant graphics and crisp-looking text. The Canon ImagePROGRAF iPF700 operates quietly at 50 dBA, bears an Energy Star certification, and uses a non-firing detection and compensation function, which automatically cleans print heads when they are clogged. The price is one of the major drawbacks of the Canon ImagePROGRAF iPF700. Some users think it is overpriced but does not perform according to their expectations. Some experienced hardware error while setting up the Canon ImagePROGRAF iPF700 and were disappointed by the lack of customer support.